The Center’s Director, Tom Tomlinson, will be speaking this Friday, April 19 at the 25th Annual MSU Geriatric Symposium. This full-day conference will take place at the Kellogg Hotel and Conference Center, and aims to present an approach to challenging conversations that healthcare professionals often need to have with older adults as they adjust to life changing transitions. These transitions relate to driving, management of finances, housing, disability, and palliative care. These conversations may raise the often delicate ethical issues of autonomy or paternalism. An ethical framework and structured approach for having each of these conversations will be discussed. Dr. Tomlinson’s lecture will be an “Ethics Overview,” discussing the principle of “respect for autonomy” and its limitations, as well as methods of promoting autonomy to older adults in an appropriate manner. 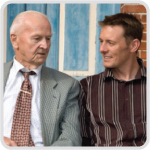 This conference is intended for health professionals who care for older adults. For more information, visit the Geriatric Education Center of Michigan’s website. This entry was posted in Bioethics Events, Outreach, Teaching. Bookmark the permalink.